I made these last week. they were pretty darn tasty. The mixing of ingredients was fast. Dealing with the pie crusts and “fixing” them took a little time but it was worth it. They were surprisingly filling, though I would say that two empanadas would make one serving. I only used one pie crust, cut the ingredients in half, and only made 8. We each ate 3 (they aren’t huge) each with two left over. Just enough spice for taste would would be good served with a side salad. 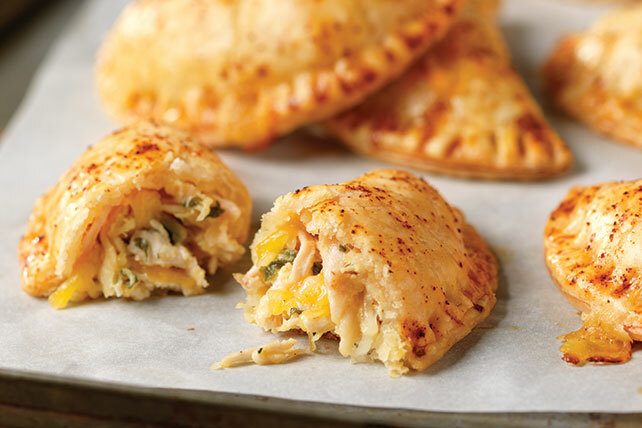 Experience a delicious burst of flavor when you try Shredded Chicken Empanadas with Cheese. Simply combine shredded cooked chicken, Mexican-style cheese, chipotle aioli and fresh cilantro for the delicious empanada filling. Combine first 4 ingredients. Whisk egg and water until blended. Unroll 1 pie crust on lightly floured surface; roll out to 12-inch diameter with rolling pin. Cut into 8 (4-inch) rounds with biscuit cutter, rerolling scraps as necessary; place in single layer on parchment-covered baking sheet. Repeat with remaining pie crust. Spoon 2 Tbsp. chicken mixture onto center of each dough round; brush edge with egg. Fold in half. Gently press tops to remove excess air; seal edges with fork. Brush with remaining egg. Sprinkle with chili powder. For more information, go to the Kraft recipe card by CLICKING HERE. Savannah Wolfe Barron (Chase Barron’s rather inconvenient CONVENIENT COWGIRL BRIDE) makes these because they are quick, tasty, and she can heap some salsa on top. This entry was posted in Writing Life and tagged characters, family, food, recipe, Red Dirt Royalty, Tuesday Treats. Bookmark the permalink. LOL, I am the tinker-supreme.